To install a Metatrader program simply copy the files either to your indicators folder or experts folder respectively depending on the program type. If you don’t know where Metatrader is storing your files the easiest way to check is to click File->Open Data Folder from the Terminal window. This will open the folder where Metatrader is storing your files. 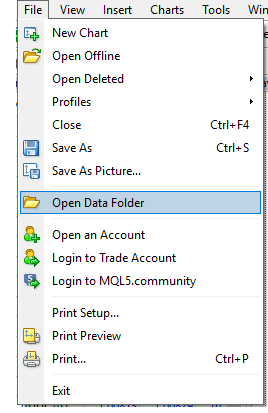 From the data folder window double click on the MQL4 or MQL5 folder, according to your Metatrader version. Then double click on the appropriate folder where you want the program to be installed. Place the executable files (.ex4 for Metatrader 4 or .ex5 for Metatrader 5) into the chosen folder. Alternatively, you can store it in your own subfolder e.g. “MyIndicators” under the parent folder. 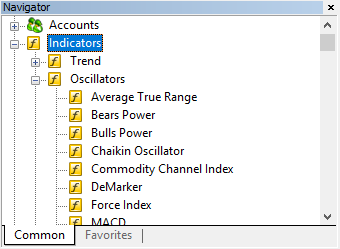 Go back to the Metatrader terminal and check the Navigator pane. The Navigator pane is toggled on or off by pressing CTRL-N. The new program should be listed in the folder in which it was placed in the step above. You may need to refresh the navigator window for the new item to appear. To refresh the list right click anywhere in the Navigator pane and select the blue Refresh icon. If the program icon doesn’t appear in the Navigator this usually means it’s incompatible, for example, the wrong program type.